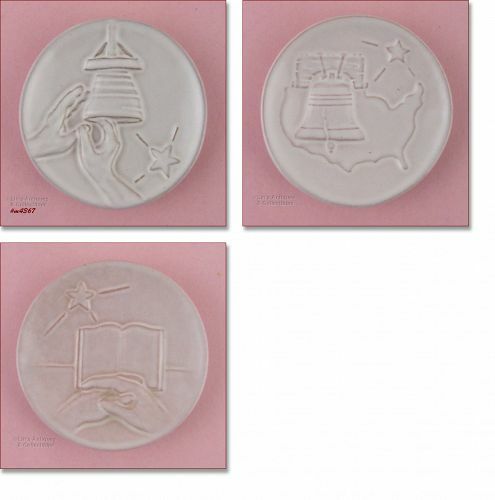 There are 2 oval shaped Frankoma Christmas “cards” in this listing and they are priced individually. They measure 3 ¾” x 3” and there’a a 1974 and a 1978. Both are in excellent condition! There are 3 Frankoma Christmas “cards” in this listing and they are priced individually. 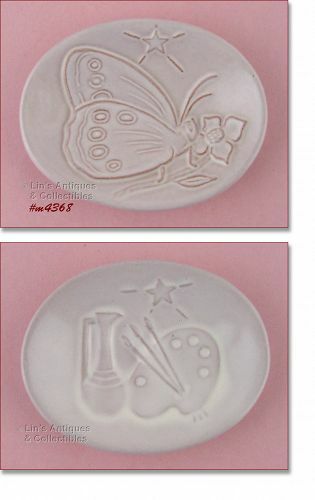 These are round shaped and measure 3” diameter. There’s a 1975, a 1976, and a 1977. 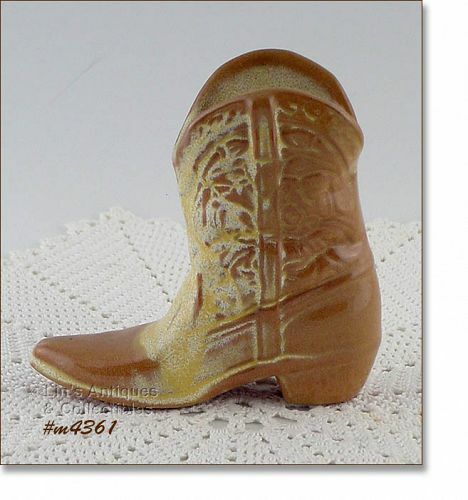 This listing has an excellent condition Frankoma boot planter or vase! It measures 4 ½” tall (at tallest) and bottom is marked Frankoma, 134. 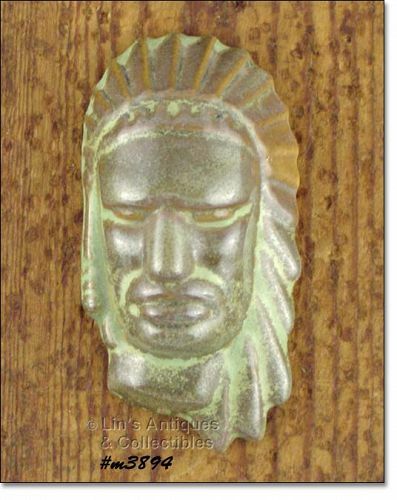 Neat item and very collectible! 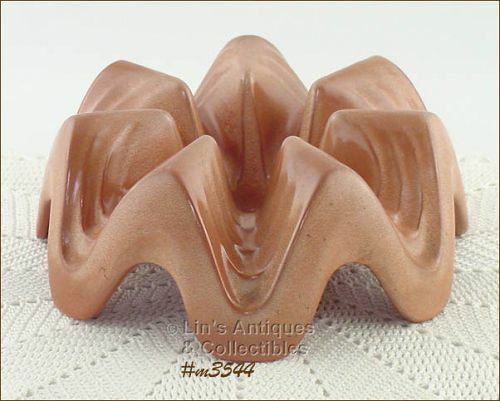 Excellent condition arrowhead shaped unmarked Frankoma ashtray! It measures 7 ¼” long (at longest), 4 ¼” wide (at widest), and 1 3/8” tall and is in the pretty Prairie Green color. This is a cutie – a “mini” pitcher! 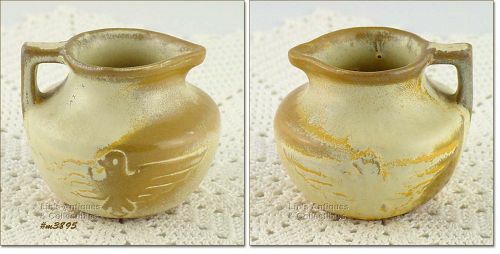 It measures 2 ½” tall, has an in-mold eagle on each side, and is the pretty desert gold color. Bottom is marked 555, Frankoma. Neat Frankoma item and not your every day find! 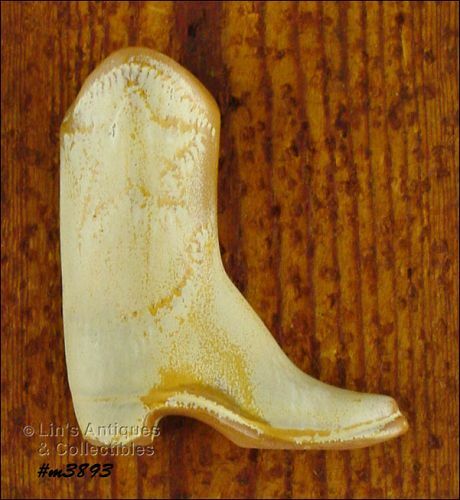 This is a cute unmarked Frankoma item – a mini boot shaped wall pocket! It measures 3 ¼” and although it’s a wall pocket, it is also free standing. Another excellent condition Frankoma item! It’s a casserole warmer (candle) base and is a pretty light tan color. Very nice! 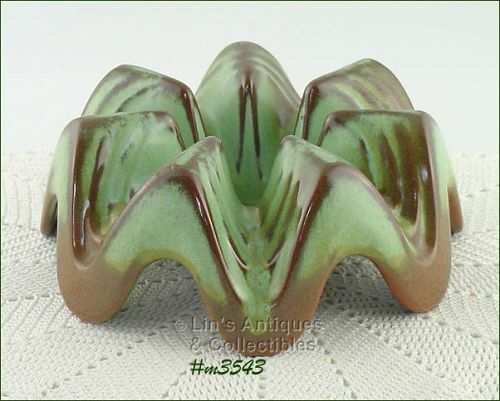 This listing has a Frankoma candle warmer base for a casserole! It’s Prairie Green and is marked Frankoma, WAI. Shreiber's 100 Year of Business! 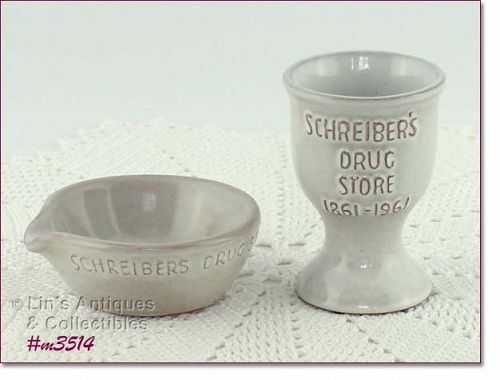 This is a find – two Frankoma pieces commissioned by Shreiber’s Drug Store of Tell City, Indiana to celebrate 100 years (1861-1961) of business! The little chalice measures 3 1/8” tall, 2 1/8” diameter (top). The mortar measures 1 ¼” tall, 3” diameter, and bottom is marked Frankoma. Both pieces are in excellent condition! Another Frankoma Christmas “card”! This one is for 1976 and back is marked: Merry Christmas, Frankoma, 1976, JF (Joniece Frank’s signature mark). This listing has a 1975 Frankoma Christmas “card”! 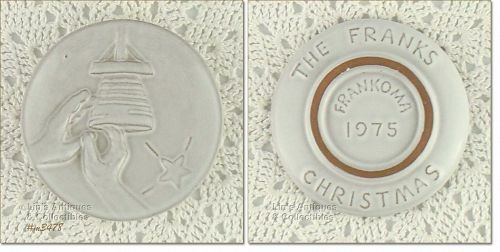 The back has “The Franks Christmas, Frankoma 1975”. Excellent condition – has a production pin-pop – that’s it! 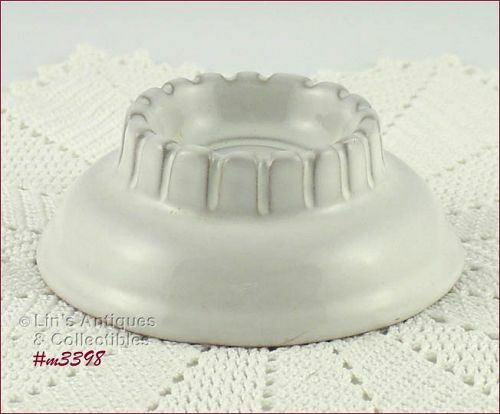 This is a neat unmarked Frankoma item – a candle holder in white sand color! 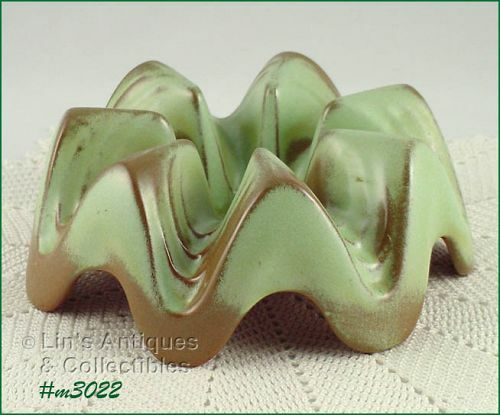 It will hold a chunky or votive candle and is in excellent condition. 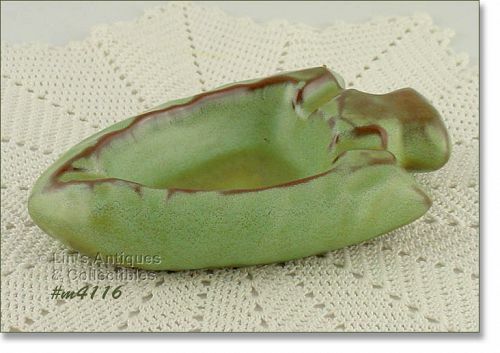 Excellent condition Frankoma leaf shaped dish! It measures 12 ¼” (at longest), 6 ½” wide (at widest), and 2” tall. Bottom is marked: 226, Frankoma. Excellent condition Frankoma warming base! It’s the pretty prairie green color and is marked WAI, Frankoma. Very useful and collectible item! 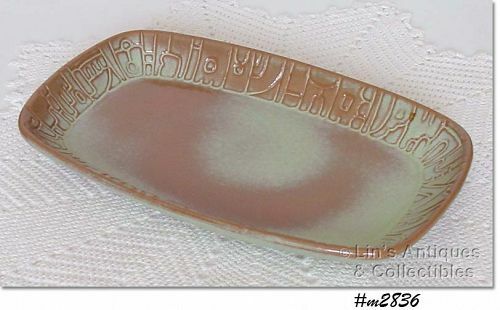 Excellent condition Frankoma tray from the Mayan-Aztec line! 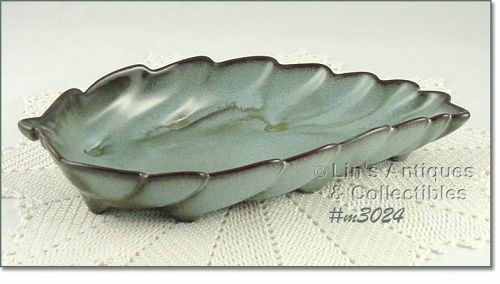 Tray measures 9 ¾” long, 6” wide, 3 ¼” tall and is in the pretty Prairie Green color. Bottom is marked: Frankoma, 7PS. 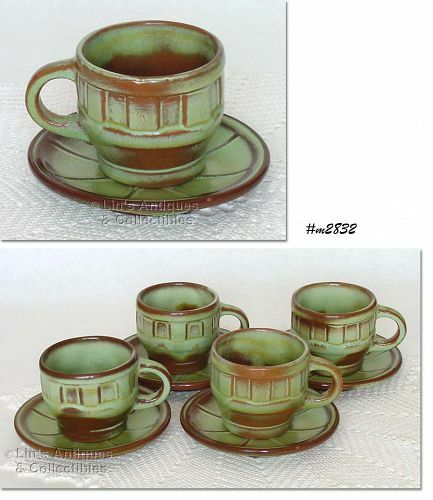 This listing has 4 Frankoma cups and saucers from the Wagon Wheel dinnerware line and they’re in the pretty Prairie Green color! Cups are marked: 94C, Frankoma. Saucers are marked Frankoma. Cups measure 2 5/8” tall, saucers measure 5 1/8” diameter. All pieces are in very good condition -- one cup and one saucer have a teeny 1/16” glaze ding – that’s it! 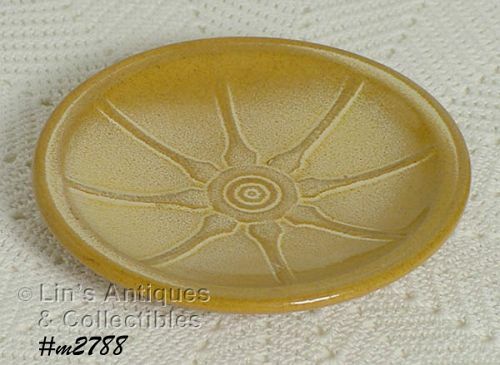 This listing has one Frankoma saucer from the Wagon Wheel line! It measures 5 3/8” diameter and is in excellent condition.